The word mycelium literally means more than one. The plural form is Mycelia. The word has modern Latin and Greek origins and was first coined in text in the early 1800s, and refers to the thread-like body of a fungus. The spores of most fungi grow a network of branching filamentous hyphae, which spread into the existing organic structures. In most fungi, hyphae are collectively called a mycelium. The hyphae excrete enzymes that break down the old and turn it into compost, which serves as nutrient for the emerging new. Where hyphae gather to form a whitish mycelium-soil aggregated zone, called the shiro, a mushroom will come out as the fruit bodies of the mycelium, with its spores spreading to grow new hyphea elsewhere. 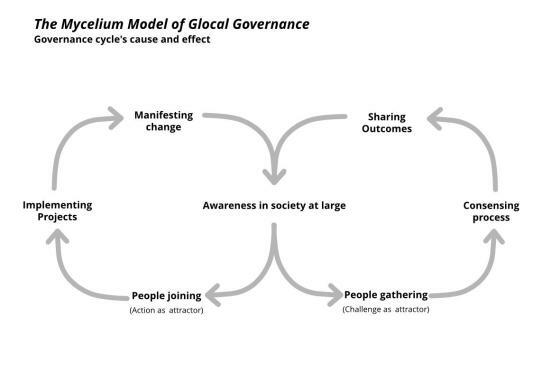 The Mycelium model suggests the transformation of the old order with a progressive and dynamic way that increases and improves our democracies in a comprehensive manner. It is a metamorphosis without an overthrow of existing order; but a pragmatic approach of consensus building with everyone concerned. Once collective realization arises, there should be no need for making "decisions" anymore because everyone will know what has to be done when the time comes to do it. 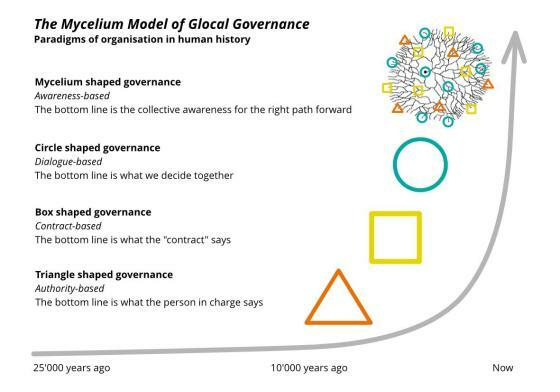 This awareness strongly forces those governmental decision making structures to abide by what the people have in their collective wisdom through open discussion and debate worked out.